I’ve been known to repurpose ice creams many different ways: Ice cream sandwiches, floats, dessert nachos, and cakes. So how could I possibly pass up the opportunity to make a milkshake? That’s what I thought! 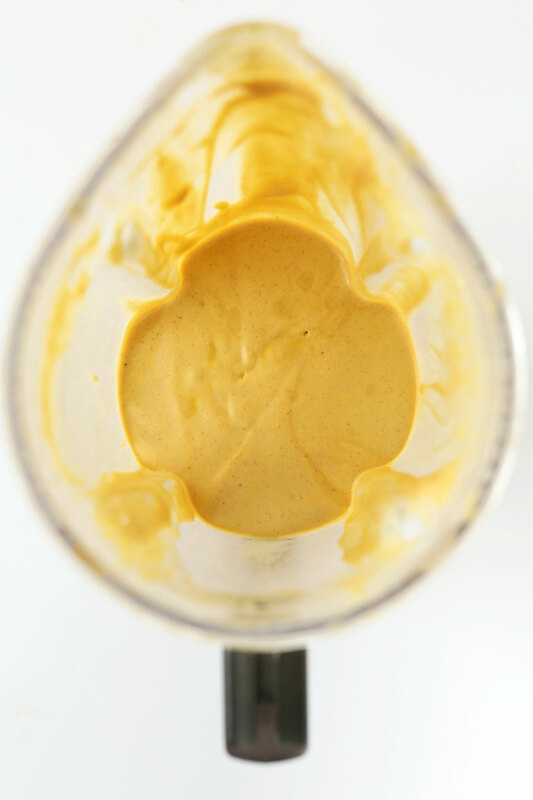 One bite into my creamy, dreamy Vegan Pumpkin Pie Ice Cream and I knew it was destined for greater things. So when I got an invite to make a recipe for How Sweet Eats‘ virtual baby shower, I knew this was just the thing. Jessica likes all things over the top, flavorful and borderline trashy. (Don’t worry Jessica, I’ll drink your share of bourbon this time). What makes this shake trashy, you ask? BOURBON, baby. Lotsa bourbon. My first thought was to make an ice cream float using apple cider or pumpkin beer, but cider is too sweet and beer is not really my thing. So John suggested a milkshake using bourbon. BOOM. Million dollar idea. It makes this shake SO tasty. That’s why I keep this guy around. Not to mention, where would I be without my part time hand model? Da-da-dang, look at those curves. And as always, simple. Just 5 ingredients and less then 5 minutes. Top it with Coconut Whipped Cream and you’re in business. I hope you guys enjoy this shake! It’s seriously my new favorite pumpkin indulgence. And I have a LOT of pumpkin goodness going on right now (exhibits A, B and C). If you make this recipe, be sure to take a picture and tag it #minimalistbaker on Instagram so we can see! Also, maybe add #mymilkshakebringsalltheboystotheyard if you’re feeling adventurous. Yes, even you, Rhonda. 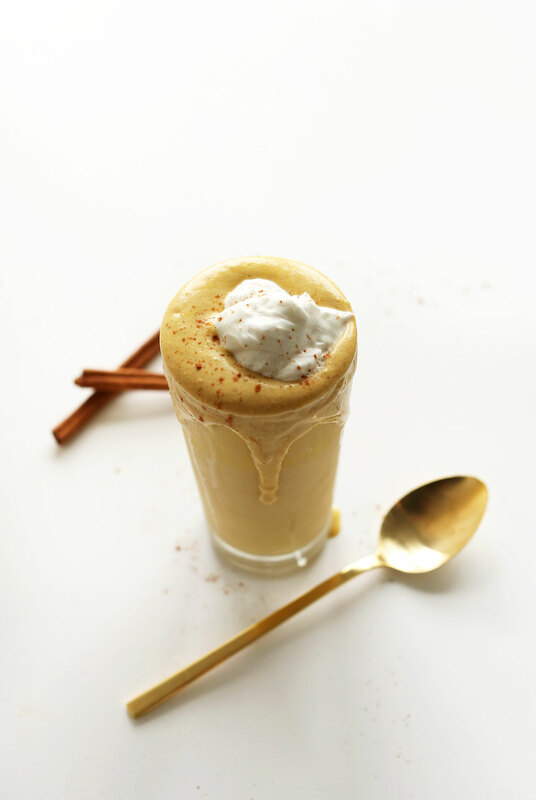 A creamy, decadent pumpkin milkshake infused with fall spices and bourbon. The ultimate cold weather boozy indulgence. 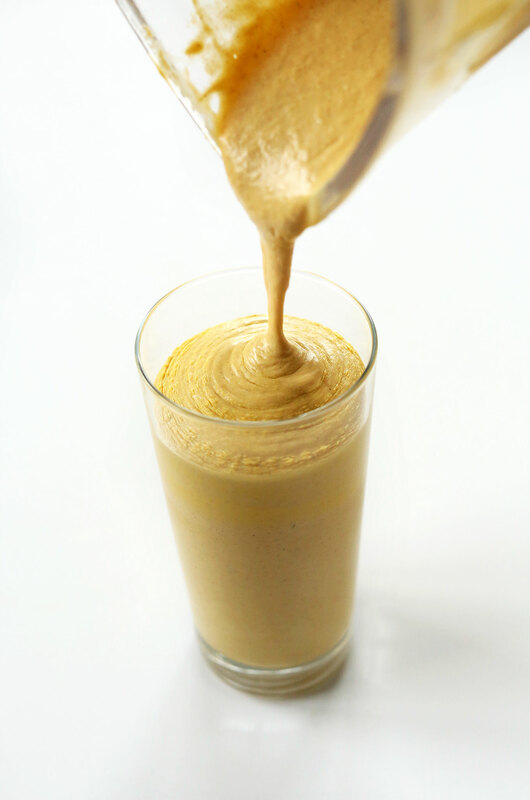 Add all ingredients except the coconut whipped cream to a blender and blend until creamy and smooth. Add more almond milk to thin, and more ice cream to thicken. Taste and adjust flavors as needed. 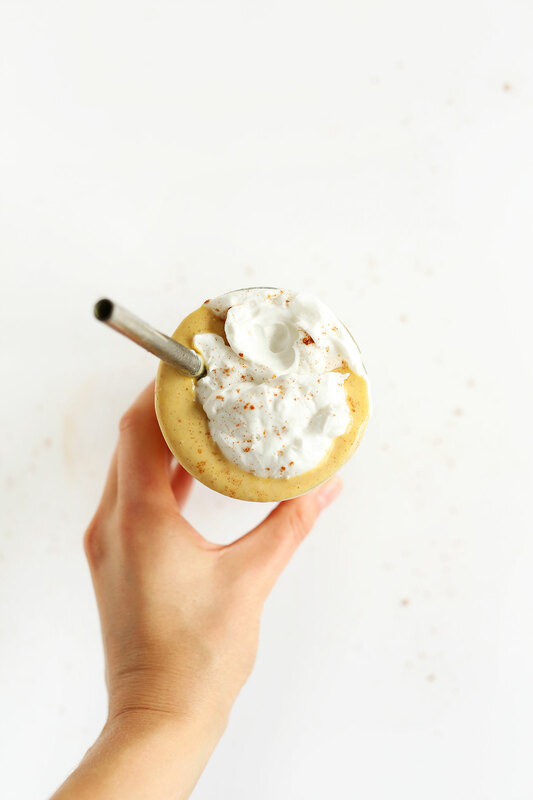 Divide between 2 (as original recipe is written // adjust if altering batch size) small glasses and top with coconut whipped cream and additional pumpkin pie spice. May we leave out the bourbon? These milkshakes look absolutely perfect. Now I need an excuse to go make one of these! What bourbon do you use? For baking, I use Trader Joe’s brand because it’s kinda cheap but still tasty! Otherwise, Bulleit is great! A little bourbon is the perfect way to trash it up, looks fantastic! BOURBON, baby!! This is perfection. Well that’s a little different, might have to add that to my list of recipes to test out! oh my goodness, these look amazing. 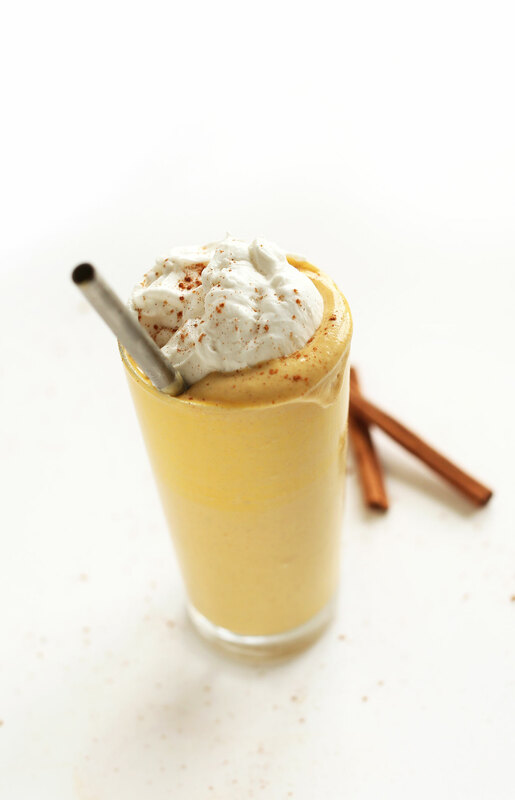 Never had a pumpkin booze milkshake before, but I bet its amazing! OMG I was thinking about making a boozy shake for the baby shower. And I’m glad I didn’t because you hit this one outta the park. Stunning!! This looks amazing! I love that it is vegan and has alcohol as well! Beautiful pictures! Pinned! hell yeah. this is my kind of milkshake! YUM! Wow that looks unreal. And your pictures are phenomenal! I super intrigued by this virtual baby shower! Well this is about to become my favorite milkshake! Love! Every time I try one of your recipes, it’s a success. I cannot wait to try this one. Great! Thanks Erin! Let us know how it goes. Woah! I didn’t think anything could compare to my favorite pumpkin milkshake.. but you just blew that out of the water! Vegan win! 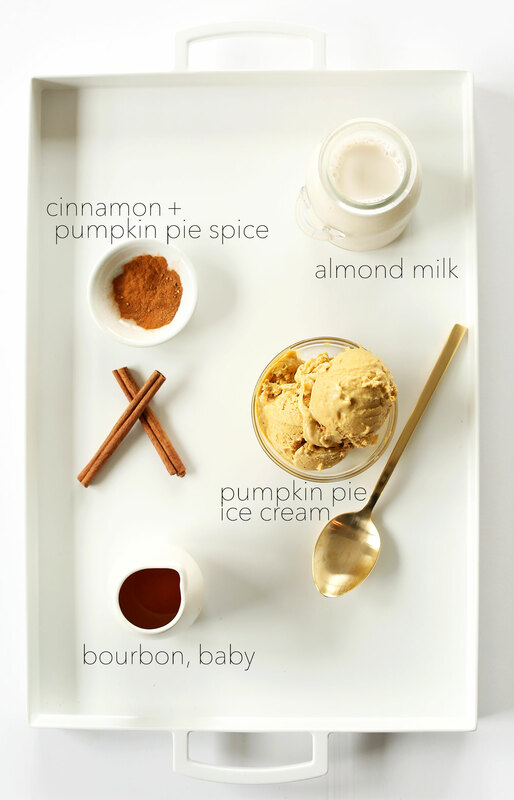 I’ve had bourbon, and I’ve had pumpkin, but I never thought of combining the two into one delicious concoction. This is definitely on my to-devour list. Just made this…. its most deliciously amazingly mouth melting! Yummmm! A must for me this holiday season!! THE BEST!!! And thanks for making a recipe for the shower! Pumpkin 4 life. This looks so freaking yummy! I love pumpkin and I’m also currentyl eating my self made pumpkin soup. But this… This Milkshake is on a totally new level! I like your blog. I have all of these ingredients in my kitchen. Right now. I am so excited!! Now this is a pumpkin treat I can seriously get behind! These photos are so great and are making my mouth water! I don’t eat ice cream, but I love this idea. Hope you don’t mind if I play with the idea to make the recipe something I can use. Bourbon in a milkshake? Brilliant! I’m not sure I could drink a milkshake any other way if I tasted this one. Omg, this would be the perfect dessert!! Shut up. This is NOT vegan! Amazing. Mind blown. This looks amazing! Pumpkin anything is just the best. you had me at bourbon + milkshake. looks SO good! Could that get any better? Absolutely note! I basically want to drink this for the rest of eternity. Thank you for participating! Oh my goodness, this is an adult milkshake dream come true! It looks so smooth and creamy! I know what I’m eating this weekend! Ohmygaaah. This is perfection. Pure pumpkin, bourbon perfection. SERIOUSLY, you make vegan food seem like the most attractive, delicious, awesome party! 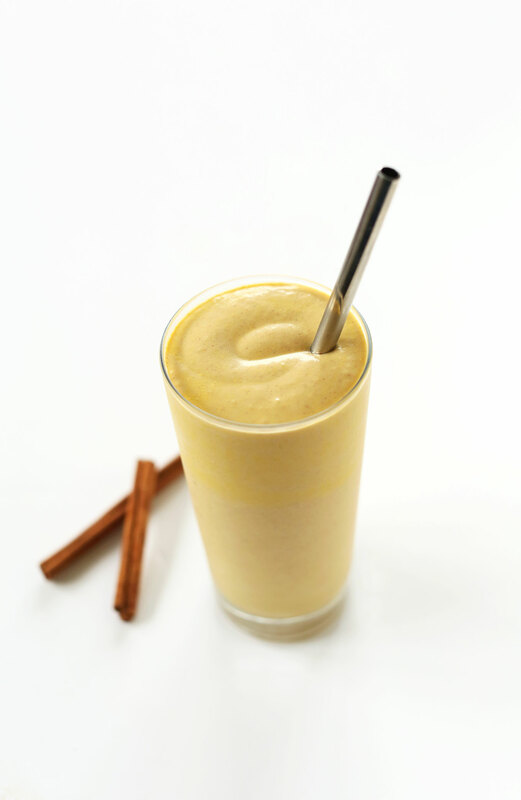 I would never believe that a vegan shake could be awesome, but DANG, GIRL this shake looks incredible! The bourbon, the pumpkin, I’m dying.